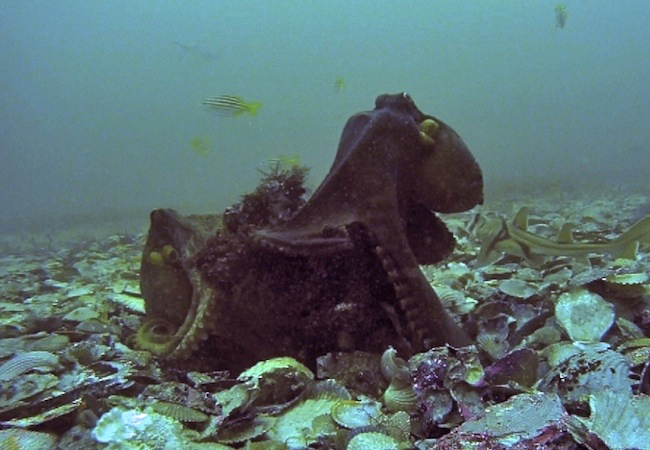 In the middle of a sandy expanse just off the south-east coast of Australia, about 50 feet down, is a site where unusual numbers of octopuses have been living, apparently continually, for at least three years now. The site was discovered by Matt Lawrence back in 2009. After he described it on the TONMO website, I got in touch and went to visit. 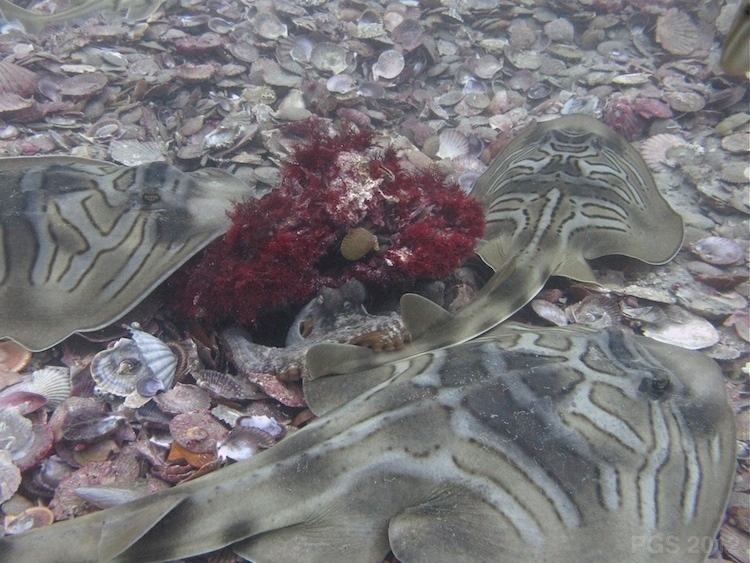 We’ve been watching the site ever since, and our first report has just appeared in the journal Marine and Freshwater Behavior and Physiology. The paper has been made freely available by the journal, [* see below] and appears here, with this main figure. In this post I’ll add some photos and say a bit more about what goes on there. 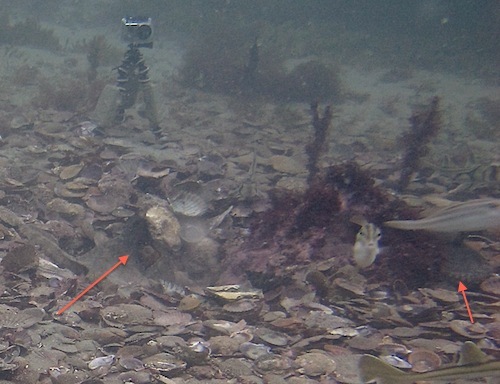 Though they’re hard to see, there are five octopuses (at least) in the shot. Two are in the lower left, two more are near the rock at the upper right, and another is at the lower right. 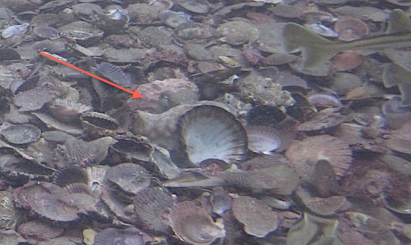 As you can see, there are scallop shells everywhere. 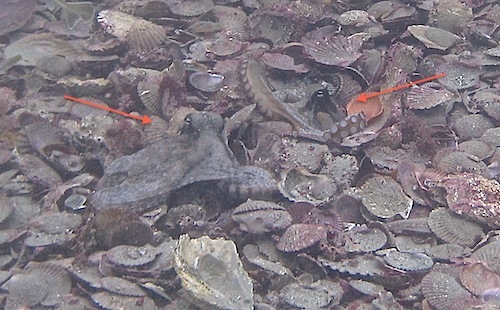 The shell bed is roughly centered on a single hard object – visible at the upper right of the shot just above, and also in the shot above it and underneath the dracula-like octopus in the first picture of the post. 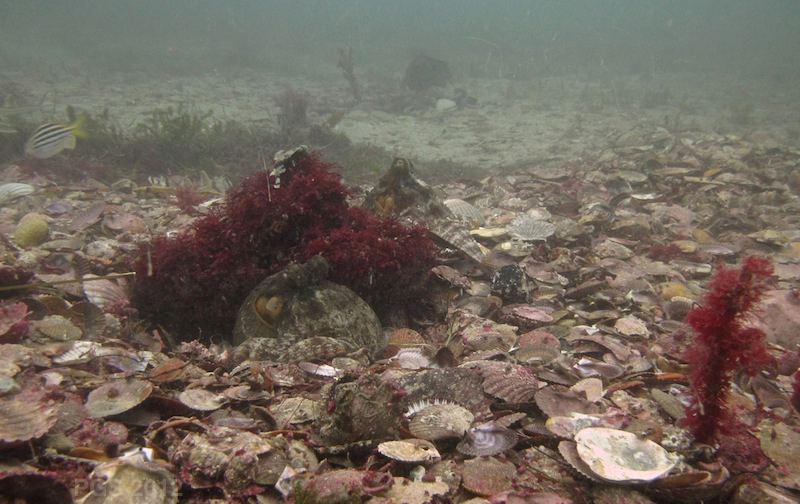 Our hypothesis is that this object, which looks like a rock but seems to be a piece of heavily encrusted metal, was the place of initial settlement by a series of octopuses, and they have brought in so many scallops to eat over the years that the debris has made it possible for the habitat to support more and more of them – a process of positive feedback. 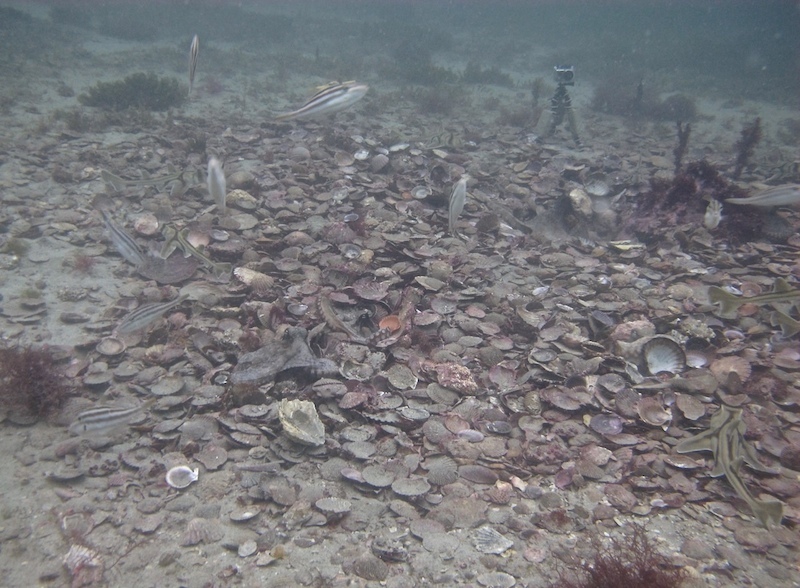 Whatever its origins, the shell bed is now the locus of a lot of interesting behaviors. 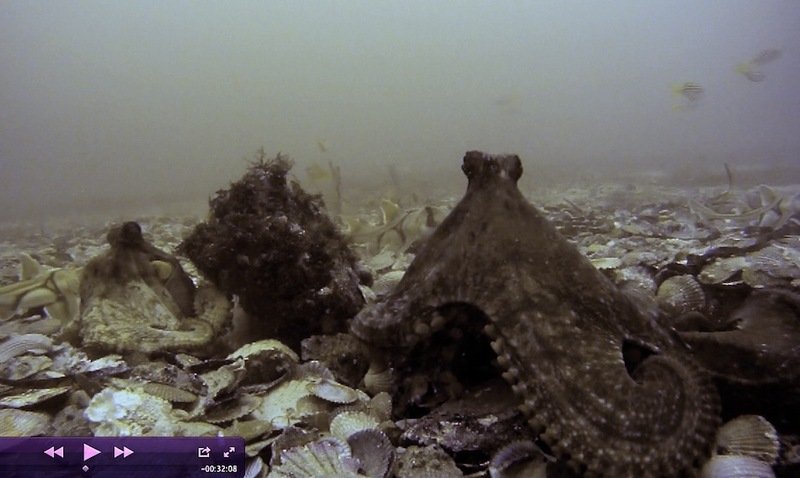 The online version of our paper includes some embedded videos, with an unusual mating, octopus boxing, and an octopus digging and strewing shells around the central den. – though occasionally the octopuses scatter them with their arms. In the third photo you can see a video camera in the background. 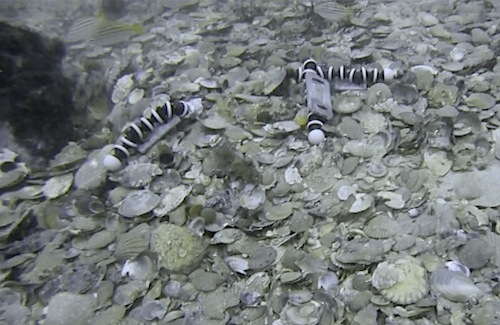 We leave these GoPro cameras around to see what the octopuses get up to when no one’s looking. An earlier post has some results from a site nearby to this one, and here are some more, taken at Octopolis with time-lapse. The octopus who stands and jets seems to be responding to a third one, barely visible on the right of the first shot. The time-lapse of this behavior is on YouTube. The photo at the top of this post was taken the same way. When we’re gone the octopuses sometimes subject these cameras to close inspection. All this was done with Matt Lawrence. Thanks also to Gavin Swan. * January 2013: The paper is not freely available at the journal any more, but send me an email if you want a copy.